Three Police Service Dog teams (consisting of one dog and one handler) provide support and assistance to a variety of CBRPS operations, including patrols, drug enforcement and emergency response. The K-9 Unit helps locate missing persons; track lost or stolen items; detect illegal drugs, firearms and ammunition; and, track and arrest criminal suspects. The K-9 Unit is also an important part of community policing, conducting presentations to elementary school students and encouraging interaction between them and police officers. CBRPS Police Service Dogs are all German Shepherds from Europe. 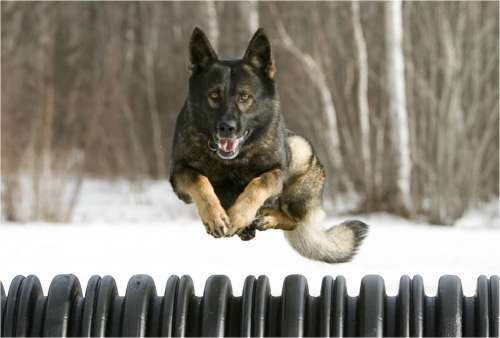 Once chosen to become a member of the K-9 Unit, a dog must go through extensive training to prove its suitability for police work. Over the course of 12-16 weeks, the dog completes a series of tests related to tracking persons, conducting searches, locating articles and detecting illegal substances.